In 1999 when the first quarters were released everyone got on the bandwagon. 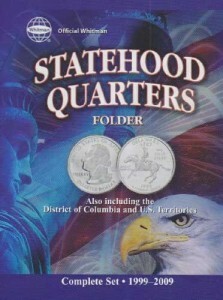 Statehood Quarters maps were being advertised constantly on CNN and other TV stations. Seems every coin hustler in creation had some sort of deal. The large cardboard maps of all the states with a hole to plug in a quarter for that state sold like hotcakes. We would get 50 or 100 in and sell them in a week. Now we sell a dozen maps and about 50 plug in albums a year, and we are the biggest coin dealer in the Tampa Bay area. Generally speaking, people now want only the newly released quarters for their maps or coin albums. In 1999 the people on TV, and promoters selling maps and Statehood Quarter coins in the newspapers, created such a demand for coins that the price of uncirculated rolls of 1999 Statehood Quarter coins went sky high. Some promoters were even paying a premium for certain circulated coins. This went on for over a year. Since then there is no furor. The price on 1999 rolls is low. Statehood quarter coins among dealers are a ho-hum deal. There is not much action, little real demand. The only quarters that are hot are the ones just issued. Not many people buy them by the roll. Most are buying to fill in their maps or coin albums. We are a bit perplexed by these buyers. You would think this would be a good collectable for youngsters. The coin albums are dirt cheap. Most of the coins can be readily found in circulation. However about 95% of our statehood quarter customers are people 65 or older. Most are collecting for their grandkids who are mainly interested in video games and couldn’t care less about collecting coins. This has been a disappointment to us. People often ask if they should save the Statehood Quarter coins they find in change. We do not think it is a good idea to hoard them. It will be a long, long time before circulated statehood quarters are worth much more than 25 cents. Few of the BU rolls have increased any amount worth mentioning. Some of the proof and mint sets containing these have done well, especially the 1999 issues, but many are now selling below issue price. Our advice is to have fun collecting these but do not go overboard. 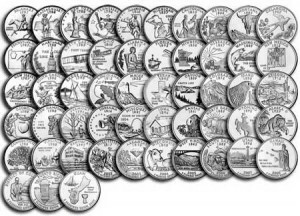 Typical mintage at each mint for statehood quarters is over 400 million. Who knows about the future? We do not think the word investing should be used with statehood quarters. At least that is our opinion.